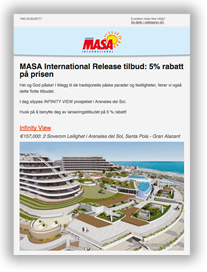 The www.masainternational.be website is owned by MASA Internacional S.A.U., whose VAT registration number is ESA77784049 and whose registered office is Avda. Alfredo Nóbel 150, 03183 Torrevieja (Alicante) - Spain. Every effort is made to keep the website up and running smoothly. However, www.masainternational.be takes no responsibility for, and will not be liable for, the website being temporarily unavailable due to technical issues beyond our control. The term 'you' or 'your' refers to the user or viewer of our website. The content of this website is for your general information and use only, and is also subject to change without notice. This website contains material which is owned by or licensed to us. This material includes, but is not limited to, the design, layout, look, appearance, text and graphics. Reproduction is prohibited other than in accordance with the copyright notice which forms part of these terms and conditions. Your use of any information or materials on this website is entirely at your own risk, for which we shall not be liable. It shall be your own responsibility to ensure that any products, services or information available through this website meet your own specific requirements. Through this website you are also able to link to other websites which are not under the control of www.masainternational.be. We have no responsibility for the nature, content and availability of those sites. The inclusion of any links does not necessarily imply a recommendation or endorse the views expressed within them. This website and all contents and services provided on and through this website are protected by copyright, trademark, and other applicable intellectual property and proprietary rights laws, and are owned, controlled, and/or licensed by MASA Internacional S.A.U. and/or its affiliates and related companies. Nothing contained on this website grants, by implication or otherwise, any licence or right to use any trademarks, logos, or other names, including, but not limited to, those identifying MASA Internacional S.A.U. and/or its affiliates and related companies or their respective products and services displayed on this site, without the express written consent of MASA Internacional S.A.U. or such third party that may own such trademarks, logos and other names displayed on this site. This website and its content is © www.masainternational.be. All rights reserved.